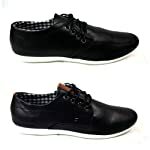 Men’s smart black faux leather casual lace up brouge shoes. 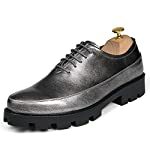 【Style】：Fashionable Hit Color,Anti-rust Metal Decoration Upper, Comfortable And Leisure,Contracted And Fluent Design, Takes British Style, Youth Trend, A Stylish Man’s First Choice.Add Luster To Your Life. 【Material】：Upper: High Quality, Comfortable And Soft Super Fiber Leather Material, Fine Texture, Wear-resistant. Inside Shoes: Soft, Comfortable And Breathable Leather Inside, Anti-odor, Ergonomic Design Is More Suitable For Your Feet. Sole: Anti-skid, Wear-resisting And Shock-absorbing Quality Rubber Sole Has Good Elasticity And Soft Performance. 【Material】：Vamp: Super Fiber Comfortable Soft Special Material, Fine Texture, Wear-resistant;Inside Shoes: Soft, Comfortable And Breathable Inside, Anti-odor,Hygroscopic And Sweat Releasing, Not Stuffy Feet, More Fit Your Feet;Shoelaces: Waxed Shoelaces, Not Easy To Break;Shoe Sole:Antiskid And Wear-resistant High-quality High Purity Rubber Light Polyurethane Sole Has Good Elasticity And Strong Grip. Free Exchanges on all sizes and colors. Choose a size bigger specially if you have a wide foot. 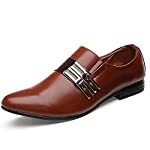 【Style】：Fashionable Front Fasteners, Retro Shell Shoe Head Collision Prevention Design, Pure Color Choice, Simple Fashion, Let You Easily Create Fashion Style. 【Material】：Vamp: High Quality Breathable Abrasive Leather.Shoelaces: Stretch Tight Shoelaces, Not Easy To Break.Insole: Breathable Inside Prevent Stink, Accord With The Rule Of Human Foot Walking, Make Arch Retractile Natural And Comfortable.Sole: Rubber Antiskid Wear-Resistant Thick Sole, Walking More Safe. Full mesh style, single-layer, engineered knit helps your feet Stay Cool and Dry. 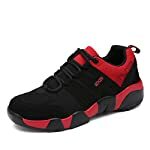 Fashion Stylish Looking, Low-Top, Lace-Up Closure And Are Plenty Wide In The Toe Area. The design of air cushion is perfect accord with human body engineering provide more the protection of the foot and knees. 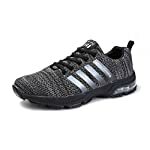 -Ultra lightweight design provides actual feelings of being barefooted for great fit and everyday comfort, with a rugged outsole ideal for a variety of terrains. 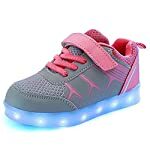 -Exquisite stitching skills and high-quality soft flap, making shoes not easy to break and effectively prevent the deformation of the shoe body, increases durability and stain resistant. 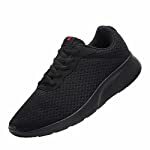 Powerful cushioning, high elastic heel support, slip wear, comfortable and breathable, so you fully release yourself in the movement, more confident. 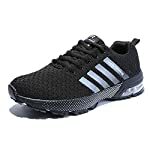 This shoe is suitable for all kinds of sports, such as the gym, running, casual walking, sports, travel, outdoor, exercise and daily wear. The lightweight shoes and breathable material keep you dry and comfortable after exercise. Good elasticity: the length of this elastic shoelace is 47 inch, and it can stretch up to 79 inch. Perfect for shoes and boots with eyelets both for children and adults. 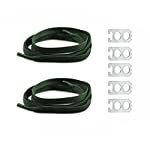 Simple and Comfortable: this no tie shoelace is easy to use and do not need any adjustments after your initial install. 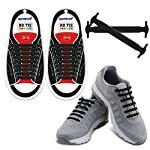 Safety: unlike traditional shoelace which always make you tripping over by the loose shoelace, elastic lock shoelace is the most safety shoelace when you are running, climbing, jogging and join in other activities.